That was from Greg, my husband. By his own admission, he is prone to the occasional hair-brained idea. But Greg’s friend Bill has chickens in his backyard and after seeing Bill’s chickens, Greg wanted to give it a try. 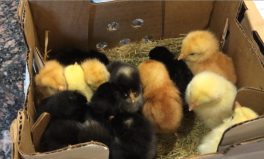 So on August 13th, a tiny cardboard box filled with 16 little chicks arrived at the post office for us to pick up. Half of the chicks went to my brother-in-law, Timm. The remaining eight lived in a rubbermaid container in Greg’s office until they were big enough, and smelly enough, to live outside. 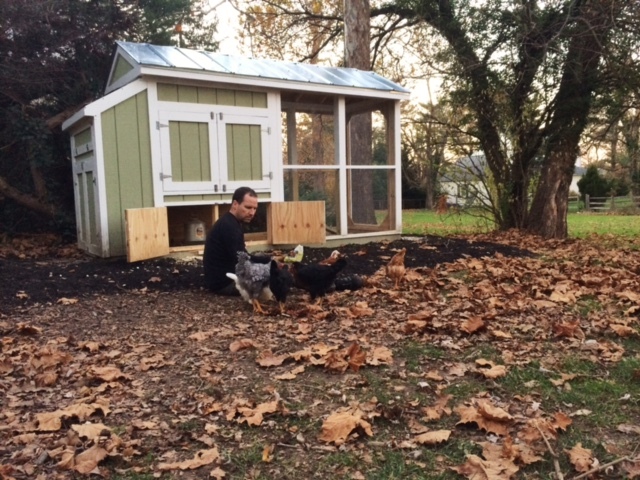 In September, Greg built a coop. It took him a couple of weekends and a few evenings, but the chickens moved out into their new residence on September 13th. Greg is busy. He runs a business, has a large family and friends, and races endurance mountain bike and running events. He doesn’t need another thing in his life. In fact, my only real concern about the chickens was adding one more thing to our already full lives. But the promise of fresh eggs and the new adventure for our family, made the idea worth pursuing. I’ve been challenged in a few ways as I’ve watched Greg take on this, and other, endeavors. He allowed a new idea to grow and inspire change. I didn’t imagine our family as “chicken people.” It’s easy to dismiss ideas based on our prior experience or a box we put ourselves in. I don’t want to close myself off to ideas just because they don’t fit the current mold. He didn’t allow a lack of knowledge to get in the way. In the information age, lack of knowledge is rarely the problem. It’s easy for me to convince myself that I won’t have access to what I need to make a change. There is an abundance of information about chickens and anything else you want to learn about out there. It might take a little work to find it, but the resources to support something new and different in your life is out there waiting for you. He recognized that a few small adjustments would enable this change in our lives. It’s easy for me to make things harder in my mind than they sometimes are. The coop certainly took some time (especially the way he did it). But once the coop was set up, maintaining our chickens has been a simple process that is now part of our normal rhythm. Trying something new has brought unexpected surprises. I knew I would enjoy fresh eggs. I had no idea I would enjoy the chickens themselves. From the moment they arrived, I’ve found them fascinating. At first they were cute and cuddly, that was fun. Then they were growing like weeds, and that was fascinating to watch. Now they are approaching full maturity and I watch them wandering around the yard when they are out of their coop. I wouldn’t have expected it, but I find delight in our chickens. Trying new things isn’t always my first inclination. I can easily talk myself out of change. But I don’t want to miss out on opportunities that will stretch me into new ways of living. I want to find more ways to be inspired and change toward the life I want to live. What’s on your “want to try” list? Elise, I loved reading the whole story and your lessons learned. it’s really true that we build up the change in our own minds. Helpful! Yes! Great conclusion!! Thanks for commenting Dan. Elise, I’m new to reading your blog. Just started today. Picked this one because I would LOVE to have backyard chickens! Great to read about your new adventure! I’m considering changing my work schedule to incorporate needed time for self-care. Thanks for this encouragement to keep on considering my choices in how I choose to live.